Apple’s iPhones are often the most talked-about devices, and the next-gen iPhone is no different. There have already been several rumors and reports about potential features to expect in the iPhone 11. The latest rumor comes in the form of official-looking images which suggest Apple may change the position of the rear camera. Well-known tipster Steve Hemmerstoffer, better known as @OnLeaks, recently posted images he said show two prototypes of the next-gen iPhone. One of the prototypes was leaked via the Indian tech site CompareRaja, while the other one was leaked via Digit.in. At the time, Hemmerstoffer said the 2019 iPhone was in the Engineering Validation Test (EVT) phase and that it was not yet confirmed which of the two designs would go into production. Now CompareRaja claims one of its “other reliable sources” in the industry has confirmed that the prototype it leaked will surely enter production. The prototype leaked by CompareRaja suggests Apple could shift the rear cameras of its next iPhone to the center-top of the handset. If Apple does opt for this design, it would be the first time the company has changed the location of the camera since the launch of the original iPhone in 2007. Is the iPhone 11 “cyclops” camera possible? In addition to changing the camera’s position, the tech site also suggests the iPhone 11 will come with a triple-lens camera setup in a horizontal design to challenge rival phones like the Samsung S10 and Huawei P30. The leaked rendering of the triple-lens camera setup shows what some are describing as a “cyclops” camera. We’ve heard talk about a so-called iPhone 11 “cyclops” camera before, but there is still no other information about it. Additionally, an iPhone 11 “cyclops” camera would be a big departure from most of the other rumors and also the other supposed prototype leaked via Digit.in, which describe a design with a protruding, square-shaped camera array. CompareRaja states that the addition of a third lens could mean that the iPhone 11 will be even more expensive than the iPhone XS. However, The Wall Street Journal claimed recently that only the Max version of the next iPhone will have a three-lens camera setup. 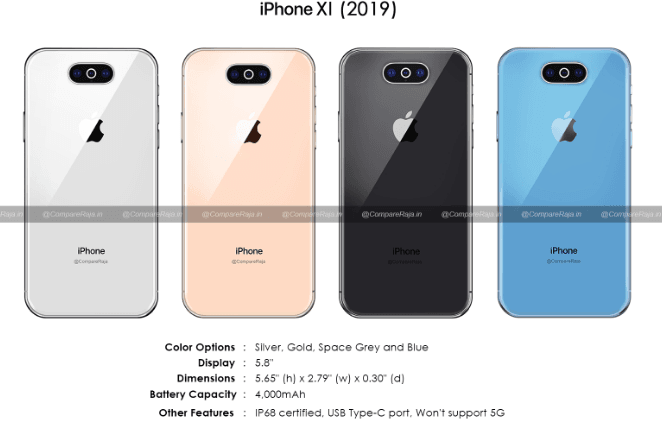 In addition to the rumored iPhone 11 “cyclops” camera design, CompareRaja claims the next iPhone will come in four colors, including the standard space grey, gold, and silver and a new blue shade. The tech site also states that the device will be IP68-certified for resistance against water and dust. The site claims the iPhone 11 will feature a 5.8-inch OLED screen, thinner bezels and a notch. Such specs would result in these dimensions: 5.65 x 2.79 x 0.30 inches. Further, CompareRaja claims the next iPhone will pack a 4,000 mAh battery, which would be the biggest ever in an iPhone. Additionally, the site states that the iPhone 11 will feature the same screen as the iPhone XS, a USB-C port and no 5G support. Will the iPhone 11 have a 5G modem? The lack of 5G support for the iPhone 11 is one thing earlier reports have also claimed. Apple reportedly hasn’t partnered with Qualcomm for its 5G modems, and Intel’s 5G modems are not ready yet. Even though CompareRaja claims the iPhone 11 won’t have a 5G modem, Reuters suggested recently that the next-gen iPhone may indeed have one. The media agency said Apple has been in talks with Samsung, MediaTek and Intel for a supply of 5G modem chips for the 2019 iPhones. Reuters’ report is based on an Apple executive’s testimony in the ongoing trial between Qualcomm and the U.S. Federal Trade Commission (FTC). The executive did not confirm whether Apple had finalized its supplier for the 5G modems or if the 2019 iPhones will definitely support 5G. Bloomberg reported prevously that Apple won’t release a 5G iPhone until 2020. Between 2011 and 2015, Apple was totally dependent on Qualcomm for the modem chips which enabled the iPhone to connect to wireless networks. In 2016, Apple sourced the chips from both Intel and Qualcomm, but last year, Intel became the sole supplier of the chips for the new iPhones.